The Canadian Mental Health Association Ontario would like to respond to the Select Committee on Mental Health and Addictions’ Interim Report, with specific reference to its section on Mental Health Promotion and Education [page 26]. The Interim Report indicates that the Committee did not receive adequate testimony pertaining to specific programs and strategies that could enhance mental health promotion in Ontario across the lifespan. This is not surprisingly because while positive mental health is intrinsically understood, there are no definitive recommendations for a specific course of programs to promote positive mental health. 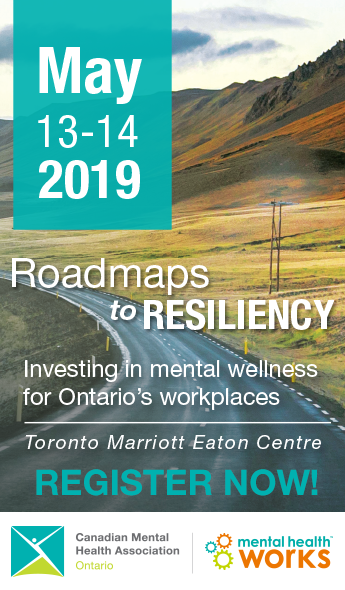 However, we would like to address this matter in more detail and provide guidance for thinking about the development of directions to promote mental health in Ontario. The World Health Organization defines positive mental health as “a state of well-being in which an individual realizes his or her own abilities, can cope with the normal stresses of life, can work productively and fruitfully, and is able to make a contribution to one’s community.” Resilience, a related concept, is defined as the ability to manage or cope with life circumstances in ways that are not only effective, but can result in an increased ability to positively respond in future. Thus, during the course of one’s life, there will be expected life transitions as well as adverse conditions during one’s lifespan that can impact mental health. The mental health of individuals and in the aggregate, populations, is also influenced by social, economic and environmental conditions. These are referred to as the broad determinants of health. Therefore, across the life cycle, populations will be impacted by the social determinants of health. Given this understanding, there is an inter-sectionality of influences impacting mental health, according to life stage as well as the systemic opportunities and barriers experienced. Recent research has demonstrated that social and economic inequalities have far-reaching consequences on health. These inequalities have a negative impact on mental health, and there is a clear gradient in which health status becomes worse the lower down the social hierarchy. People in low-income or other disadvantaged circumstances bear a disproportionate burden of poor mental health. For example, teenagers from racialized populations may experience discrimination and social exclusion, resulting in low educational attainment, lack of economic opportunities and lack of social support. Ontario’s recent ‘Roots of Youth Violence’ report addresses this experience among some youth, its impact on mental health and the consequences for communities. Thus, strategies must address fair opportunities and access to the broad determinants of health that enable all Ontarians to achieve their fullest health potential. This is a matter of equity. To this developing framework is the concept of setting. Building healthy, supportive and accepting communities — where living and working conditions are safe, stimulating and satisfying — is an integral component of any health promotion strategy. It recognizes that the changing patterns of life, work and leisure have a significant impact on health. Thus, mental health promotion strategies are by their nature also intersectoral. It is important to know that while the influences on mental health are conceptually complex, many jurisdictions are in the process of developing multi-faceted strategies to promote mental health, with Great Britain and Australia being leaders in this arena. Australia’s VicHealth Mental Health Promotion Framework provides guidance in taking action to develop comprehensive, intersectoral strategies to promote mental health, incorporating the elements of target populations, including those at-risk and across the lifespan and settings (see Figure 1). A first step in developing key strategies for mental health promotion is to identify poor mental health in priority populations. While available data needs to be improved, much data already exists in Ontario that can be acted on. This includes not only national and provincial population level data but also special studies and reports, including at the community level. Utilizing this data, mental health promotion strategies should be able to be prioritized in Ontario. CMHA Ontario collaborated with the Centre for Addiction and Mental Health, Health Nexus, Ontario Public Health Association and the Centre for Health Promotion at the University of Toronto to prepare Mental Health Promotion in Ontario: A Call to Action. The report identifies social inclusion, freedom from discrimination and violence, and access to economic resources as the three most significant determinants of mental health. A compendium of effective, evidence-based strategies for various populations and settings are identified as options. The Centre for Addiction and Mental Health has produced best practices guidelines for child and youth, as well as older adults. The Public Health Agency of Canada has a best practices portal. Under the keywords of ‘mental health’ 225 documents are found. In addition, a developing area of attention is health impact assessment (HIA). Health impact assessment is a means of assessing the health impacts of existing or contemplated policies, plans and projects on a population. These would include the effects of non-health policies on mental health. HIA is similar in concept to the way environmental assessment takes place. The National Centre for Healthy Public Policy located in Quebec is a Canadian centre funded by the Public Health Agency of Agency investigating the potential role and utility of HIA tools. HIA will likely be useful to assess how policies in such diverse areas as, for example, education, housing, recreation, workplace policies and income support may impact mental health. This is the basis for fostering healthy public policies , one of the five central strategies of health promotion. But in order to utilize these type of tools they must be endorsed by policy-makers. They also require a whole-of-government approach. There is significant momentum in Ontario, across Canada and internationally addressing mental health promotion policy and strategies. If you wish, we would be pleased to provide you with much more literature on current dialogue, directions and evidence-based strategies.